The Virginia Sports Information Directors (VaSID) honored six Christendom College student-athletes this past week, naming them to the prestigious Academic All-State team. Recognized for their tremendous academic achievements over the past year, the six student-athletes all retained a GPA of 3.6 or higher during the 2015-16 academic year, representing the high standard Christendom sets for all of its student-athletes. Student-athletes from a variety of different sports made the list for Christendom, including two soccer players, three members of the softball team, and one volleyball player. Sophomore and men’s soccer player Kieran O’Donnell led all Christendom student-athletes with a GPA of 3.921, followed by softball players Katie Kelly, a junior, and Annie Adams, a senior, who retained a 3.877 and a 3.868 GPA respectively. Representing the women’s soccer program, junior Monica Wilson achieved a GPA of 3.762 during the academic year, with junior Elizabeth Rensch, co-captain of the women’s softball team, attaining a 3.696 GPA and senior Angela Townsend, a member of the volleyball team, rounding out the group with a 3.661 GPA. The six student-athletes join athletes from forty-one other colleges and universities across the Commonwealth of Virginia on the Academic Team, including student-athletes from Virginia Tech, the University of Virginia, and Liberty University. In order to be eligible for the team, students had to achieve at least a 3.25 GPA — a number that Christendom’s student-athletes easily cleared. The statewide recognition comes on the heels of four Christendom softball players being recognized on the national level as part of the 2016 USCAA Softball National All-Academic Team. The players — Annie Adams, Mary Solitario, Elizabeth Rensch, and Katie Kelly — all achieved a GPA of 3.5 or higher during the academic year. 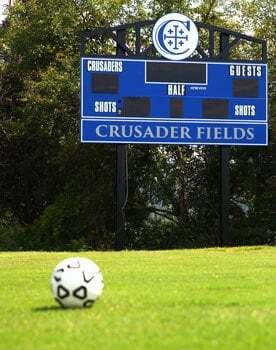 Christendom’s high-caliber education has led to numerous student-athletes being named to all-academic teams over the years, with the basketball and soccer teams producing numerous award-winners. To see the full listing of the VaSID Academic All-State Team, please visit here.